If you dream of eating blackberries fresh off the vine, you can install a wire blackberry fence or trellis and grow blackberry plants around it. A blackberry fence or trellis gives the blackberry plant some place to grow and keeps the fruit from touching the ground, so it won't rot before you can pick it. Wire blackberry fences, which look similar to grape wire fences, are typically used to curb the blackberry's tendency for wild abandon, and plants are trained to follow the wire to keep the structure of the plant organized and the fruit in easy reaching distance. You can pick blackberries, like these, straight off the plant if you have a blackberry plant and a wire blackberry fence. Set your first post at one end of where you plan to install your blackberry fence. Dig a hole 1/3 of the length of the post deep. Tamp down the soil at the bottom of the hole with a 2-by-4 or tamper. Place the post inside the hole. Place a level against the side of the post to make sure it's straight. Add 6 inches of dirt to the hole. Tamp it down with the 2-by-4 or tamper. Check that the post is still straight and level. Repeat until the post is secure, and the hole is filled all the way to the top. Set another post every 6 to 8 feet until you've covered the entire length where you plan your blackberry fence to go. 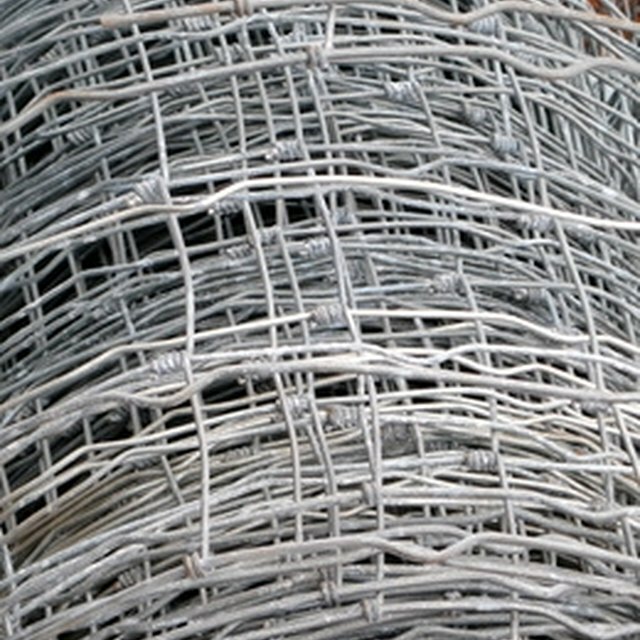 Unroll a length of basic, single fence wire until it stretches from one end of your fence to the other. Add enough fence wire to this length of wire that you can loop the wire around your fence post at least once or twice on both ends of the fence. Loop the wire around the top of your first end fence post. Tie it off. Staple the end in place a couple of times with a few fencing staples. Tug on the wire gently a few times to make sure it's secure. Pull the wire taut when you reach the next fence post. Staple the wire in place. Repeat the process until you've stapled the wire to every fence post except the last. Tie the end of the wire around the last fence post. Staple it into place. Run another wire about half-way down the fence post from the first wire. Follow the same steps to install the wire. When you're done, you'll have a completed wire fence for blackberries with two wires--one at the top and one in the middle. There is no bottom or third wire on a wire blackberry fence. A third wire would be too low, and your blackberries, once hanging and growing on the fence, might touch the ground from a third wire, rotting the fruit. Always wear safety glasses and durable leather gloves when installing any type of wire fencing. If the wire is not secure, it can whip around and cut you or hurt your eye.